Greetings. I bring you God’s blessings, my dear friends. The person who has walked through this first gateway needs above all the insight that nothing can be gained without discipline, regular work, and the best will to give each day some time to get closer to God, to liberate the often dormant and hidden forces of the soul, and find the connection to the rays of divine energy. This can happen only through self-discipline and regular practice, preferably always at the same time of day. Yet it is not possible to establish a rule valid for everyone without exception. For a few a more spontaneous way may be better, but only when in spite of this spontaneity no day is omitted and solely time and place vary. As a rule, regularity is advantageous. Concentration in prayer is beneficial not only as a training but also because each thought builds a form. With the thoughts of prayer you build harmonious forms, so that the “thought-prayer” activates favorable energies even before you have learned the “feeling-prayer” or meditation. Yet thought forms, though they may not have the power of feeling forms, can nevertheless manifest their own greatness when coming from a full heart, without self-deception, rooted in sincere willpower. This is the first step on this particular segment of the path: the pure power of thought through concentration in prayer, and the liberation of the feeling currents, which brings about some loosening of the spirit. This then is meditation. Once you have learned concentration in prayer to some degree, practicing regular self-discipline for this purpose, you may encounter the problem of becoming too mechanical. Now that you have progressed so far, you find yourself struggling not to fall into the opposite extreme of overdiscipline where prayer becomes a fetter. Then the time has come for you to learn to bring prayer into the deeper layers of the soul. At this point, too, helpful tools are available. Prayer, as I said, is in the domain of thinking. It comes from here [pointing to the head], while meditation comes from here [pointing to the chest], what I call the spiritual field of the human being. In the solar plexus, a person’s entire spiritual picture is imprinted. Those who free the feelings here and so determine when and how to connect with God become, to a certain degree, master over themselves by overcoming their inner obstacles. Now you may ask, how could you enter into this vibration. I say: All inner currents diverted into wrong channels create obstacles. All that lies unrecognized and ferments in the subconscious is an obstacle. Wherever you have difficulties to attune to the vibration, wherever you sense a resistance, you can be sure of unrecognized violations of the laws in your soul. Self-recognition, self-analysis, and the digging out of these currents are the only means, and to do this is not possible without outer guidance, help, and instruction. Apart from this, one cannot establish any general rules. It varies from one person to the next. You must find the place in yourself where you sense the vibrations. It is not right to expect this to happen immediately and every time. Once in a while spiritual influences may lift a human being into a higher vibration even when the inner obstacles are still present in the soul, but these influences are rare. A person should not evade the issue by saying, “I am not always capable to be attuned; I have to be in the mood for that.” But the “attunements” should no longer be governed by moods. You need to control them yourself, and this is not possible unless you cultivate systematically your spirit and your development. You need to become master of yourself, not be mastered by moods and depend on them for the kind of contact to God which penetrates the entire being. This is the purpose of this path, this is the goal, which, however, you cannot expect to attain right away. On this path you will advance to a point where you determine yourself when the pure forces will be ready to move freely from within you. This goal can be achieved only by following a slow, laborious path. Pray for help in this respect as well. Very specifically, Christ will help you. Whoever turns to him will receive help, for he has promised it to you. There are several tools to liberate the soul forces: For some it may be helpful to remember the last time they felt a strong vibration that connected them to God. Perhaps by conjuring it up in their imagination they can relive it emotionally. Others may find the connection easier with the help of a specific passage from the Bible, a certain prayer or spiritual law. The tools may vary, and each of you need to explore your individual point of connection personally. Best of all is a victory over yourself, an insight into the self that is real, complete and wholehearted. When you overcome a resistance you open yourself to God’s will and truth. Such victory frees many powers and causes a wonderful vibration that leads to meditation, even though in the beginning it cannot be attained every day. Some other time I will talk more about the soul-prayer, or meditation. Today I would like to fulfill the promise I have given some time ago to share with you a further interpretation of, or meditation on, the Lord’s Prayer. I talked about the meaning of this prayer and the way to meditate about it once before. There are so many possibilities and ways. Then I spoke in general terms. Tonight I want to shed a different light on it and show you how you can meditate on the prayer—it can easily take an hour—and find in it whatever you need at any time, for everything is contained in it. I will show you how the prayer can be applied in a very personal way and how it can solve all your problems. OUR FATHER. When you think of the meaning of these words, you presumably picture God as the father of all beings. But as you say the words very intimately to yourself, try to meditate very specifically on how God’s fatherhood also applies to those people you do not like, or do not care for, toward whom you feel resistance, or with whom you just happen to be in discord. It does not have to be always a feeling of hatred; it is enough to be irritated with somebody. Go into your stillness and ponder that these people are the children of God. Calling yourself a child of God is justified only when you allow that the people who bring out unpleasant feelings in you are also God’s children, just as you are. When you succeed in doing so, your attitude, and therefore your feelings too, will undergo a subtle change and you will become more relaxed and free. To do this may at first be difficult and cause resistance, because your feelings are not always willing to change. Whenever there are strong negative feelings of any kind there has to be a tight inner knot. Take such a resistance as a signal that tells you how important it is to dissolve the inner knot. If you harbor negative feelings, something in you must be unresolved, no matter how wrong the other person may be. After this insight comes the will to straighten out whatever is wrong within you and the readiness to allow for new recognitions, inspirations or teachings. Then practical means will also be given to you to free yourself from the unresolved, negative state. Ask for it, want it—and suddenly, as you meditate on the deep meaning of these words and how to apply them in your life, a heavy pressure will be lifted from your chest; you will feel as if you had been freed of a burden. Try it also another way: Bypass everything that bothers you in the other people and visualize their perfection. Try to recognize how and where the divine spark manifests through them. Always remember, whoever seeks, will find. You will discover qualities in them which will clearly indicate their higher self and entitle them to be regarded children of God. It is so important to draw a line separating the higher and the lower self, to pinpoint what belongs to each one. The higher self is eternal, immortal, and is of God. The lower self is temporal, and not of the true reality. Do not do this just with others. Start with yourself. For when you can distinguish the two in you, it will no longer be so difficult to love your neighbor, and you will find it much easier to recognize someone you do not like as your brother or sister. You will then allow your higher self to unite with the higher self of your neighbor. All this is contained in the first two words of the prayer: Our Father. WHO ART IN HEAVEN. Heaven is within you, not outside. Seek it therefore in yourself, find your own perfection, which already exists, though it may be veiled and covered up. And seek Heaven, seek God within the soul of your neighbor, even the one you reject. For only thus can you find the eternal, living God. HALLOWED BE THY NAME. You hallow the name of the Father by trying to fathom His laws and fulfill them. Because for every modality of life there exists a spiritual law. When you are confused by problems in your life, it means that you have not found the appropriate spiritual law. When you say, “Hallowed be thy name,” ask the question within: “Where are my difficulties, what are my problems? I must be violating a spiritual law, even if only unconsciously, but I no longer want to do so.” Ask God to help you understand what law you are violating. Ask Him for an answer and you will learn to establish a personal connection through which you will truly hallow His name. For when you look at your problems in truth, with honesty in your heart, you will also receive the answer. It might not come at the same moment, but if you are alert and open, life will bring you the answer. THY KINGDOM COME. When you hallow God’s name by following all spiritual laws you also bring His kingdom close to you. For it is within you. You always think, if you give it a thought at all, that God’s kingdom is somewhere outside, that it will descend to your earth, and that all you will have to do is to go where God’s kingdom has manifested, and enter. These are the usual vague ideas about the kingdom of God, false thought forms that you erect in your imagination. God’s kingdom must be created within you, and this can happen only when you go through this schooling successfully, by learning to know and to apply the spiritual laws. THY WILL BE DONE. I do not need to say much about this, since I have done so many times before. But I want to emphasize again how difficult it is for most people to apply these words on the personal level. You claim that you do not know what God’s will is and that you would follow it if only you knew what it was. I have said to you that whoever strives to make contact with God’s world to find out what God’s will is, and then to fulfill it unconditionally, even while you are still doubtful, will receive the answer. And rather than trying to rack your brains about how to fulfill God’s will when you feel unsure, turn to those areas where you do not require an answer, for the answer will be obvious once you begin to think. Everybody can be quite sure that it must be God’s will to follow the path of perfection, in whatever way it offers itself to you. You can be quite sure that it must be God’s will that you face yourself in honesty instead of choosing the more comfortable way of pushing away what creates uneasiness, or blaming others and circumstances to avoid the necessity to seek the wrong within you. Contemplate what causes your inner resistance, and you can be sure that when you feel disharmonious you have violated a divine law. 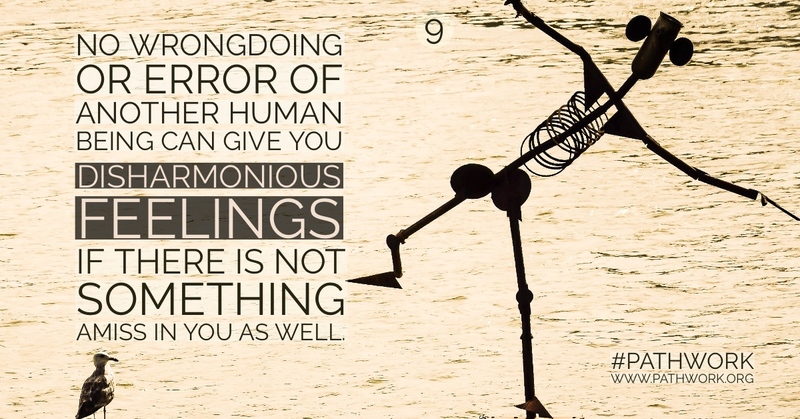 No wrongdoing or error of another human being can give you disharmonious feelings if there is not something amiss in you as well. Your answer must be that you have in some way failed to fulfill God’s will. For one person, feelings of disharmony might take the form of general religious doubts which ultimately are connected to personal problems, for another the causes might be more directly of a personal nature. But whenever there is a feeling of heaviness, of anger, of resistance, of fear, of any disharmony, you have a clue that something in you is not quite in order. For otherwise there could not be so much darkness in some of your life situations. If you strive for the answer wholeheartedly, even if it takes long to find out, you will get it sooner or later. When you pray for the answer in order to fulfill God’s will, it must come. Do not be afraid of it, for God’s will is always wise and loving and leads to happiness, even though the transition is a struggle. Then ask yourself: “Am I truly willing to do God’s will even if I do not like it at first?” I have given you a whole lecture about this subject and you can use it in this connection. ON EARTH AS IT IS IN HEAVEN. What does this mean? What is Heaven? What is Earth? Is it not a bit foolish of you human beings to say a prayer that God’s will be done in Heaven, which in some people’s minds is somewhere outside? If Heaven were outside, would it need your prayers that God’s will be done there? Could you exercise such influences there? Certainly not. Of course you can, to a certain degree, do it on Earth, in that you, through being on the path of perfection, by the influence and light you spread, work for God’s kingdom in your fellow human beings. Heaven is within you. It is your spirit in its perfection, which waits for the walls of the lower self to be broken through. The God in you shall manifest in every detail in your spiritual as well as in your earthly life. To what extent is this already a reality in your life? In what respect does God not yet penetrate your being, your actions, your thoughts, and your feelings? Try for instance to imagine this: If you were told to relinquish something to which you cling believing it to be God’s will—it could just be an opinion—would you be willing to let it go and consider that it may not be so? Or would you rather convince yourself of the contrary, just because you want it that way? Try to pinpoint in which area of your life you have this attitude. Then face yourself in honesty. What is more important for you: the truth, or a conviction you have clung to for one reason or another? If your conviction is right, don’t you believe that God will confirm it? But first there must be a willingness to let go. Whenever you feel a tightening rigidity, even if your opinion is right, you prevent the heavenly kingdom from manifesting within you. On the other hand, where you are in error, the truth cannot penetrate. When the thought forms are false, God’s kingdom cannot come to you. GIVE US TODAY OUR DAILY BREAD. This, too, is often mechanically repeated, without attaching any meaning to it. People assume even if they do not clearly formulate the thought, that earning one’s daily bread has nothing to do with God. But truly, I say to you, my dear ones, you cannot do anything good that is not blessed by God. Without God, nothing will succeed, no matter how hard you try again and again. A person who has had some spiritual schooling can discern very accurately, when he or she thinks back on his or her life, what had God’s blessing and what did not. “How does the difference feel? Where do I repeatedly fail? In what areas do I always have trouble? What is the true reason for it? What did I do wrong? In what respect do I have a wrong attitude?” Think about it and surrender yourself to God, entirely. Be ready to let yourself be guided to obtain both your earthly and your spiritual bread. The spiritual bread is so neglected. You believe it is less important than the material bread. No, my dear ones, the spiritual bread is more important, much more important. First you need to make the effort to receive spiritual nourishment: desire it. That is the gateway through which all earthly problems will be solved, and not the other way around. Whoever yearns for the spiritual bread has already reached a certain level on the path. FORGIVE US OUR TRESPASSES. The prayer says, “Forgive us,” not me alone. This includes all human beings, even those who have hurt you and whom you may not be able to forgive completely. If you honestly wish that God may forgive them, then you are liberated from a dark spiritual form in you, which attracts harmful energies and dark influences. Think what these words contain: God should not forgive only you and those whom you love, but also those for whom you still may harbor negative feelings. Often you are not even clear about your own guilt. Humans tend to produce false, unhealthy, exaggerated guilt feelings which are not justified. The inner process works in the following way: You shy away from admitting your guilt where it is justified and where you could feel a healthy, constructive repentance which would never drag you down or discourage you. When you ask God for forgiveness with this healthy repentance and really want to change, you will feel that you are forgiven and liberated and will know that a burden has been lifted from your shoulders. This happens when the will to change and to carry the good intention through is sincere and persevering. But often you will not face the real guilt, partly because in your conceit you want to see yourself better than you are, and partly because it takes too great an effort to bring about inner change. Deep inside you know that this cannot happen from one day to the other; neither can it happen without effort. The spiritual core gives out signals, spurring you on to recognize your guilt, but your lower self interferes with its pride and laziness, so you often assume guilt that is not genuine. It is as if you said, “See, I repent, I admit, but actually, I am not really guilty here.” Naturally, these are unconscious processes, and they have to be brought out into the daylight. This is the difference between false guilt and real repentance. The experience of all people who walk the spiritual path has always been that those who recognize their real guilt lose automatically not only all false guilt complexes which pull them down, but feel instantly relieved and at peace, because truth always brings about liberation. To open oneself wide and be willing to overcome the resistance is a struggle. So people will be afraid to admit the real guilt and therefore will rather produce in their unconscious all kinds of unreal guilt feelings, which either do not at all apply, or which cover up faults which they do not want to see because they are not yet ready to accept themselves as they are, in their momentary imperfection. Guilt complexes are unreal and therefore never lead to liberation. They create vicious circles, they lead to heaviness, sadness, whereas truth always liberates, no matter how unpleasant it may feel at first. AS WE FORGIVE THOSE WHO TRESPASS AGAINST US. How many people say this prayer, yet they do not have the slightest intention to truly forgive. Here, too, there is often self-deception. While no hate may be left, resentment is still present; if you have not liberated yourself from that, you cannot be free enough to have spiritual experiences. It is so difficult for you to achieve complete forgiveness, because you lack the understanding of the other person. Therefore ask for this understanding, ask for the insight you lack in this respect. If you really want it and do not wallow in your resentments, as you so often do, then all this will be given to you. You human beings do not want to understand that you cannot do it by yourselves. You need help. This is why this sentence is part of the prayer. For if it were possible to do it with your will alone, you would not need to pray for it. You do not pray that you should be able to move from one spot to another; if you have healthy limbs you can do it at will. But you need help in order to be able to really forgive. And you do need help in order to face yourself in total honesty and to know yourself without your mask. And you need help to meet your resistances and to accomplish the inner change. So pray for it. This, too, has to be confronted: “Do I truly forgive all people from the bottom of my heart?” When you clearly see that you cannot yet quite do this alone, you can ask for help. And understand that not forgiving burdens you, makes you unhappy, blocks the light and freedom that you desire. Not forgiving harms you much more than it harms those whom you cannot forgive. LEAD US IN OUR TEMPTATIONS. I repeat for those friends who joined our circle recently: What is usually said, is “Lead us not into temptation.” These words give rise to misconceptions and can do harm. For God does not lead you into temptation. Rather, the meaning is for you to pray that God may lead you when temptation comes to you; to pray that God may guide you so that you can resist it, that you have the strength and the vision to be victorious. If this is what you visualize, then you can also say, “Lead us not into temptation.” The words do not matter so much unless they confuse the concepts. Now, what is temptation? Temptation is within you. It does not come from the outside. And even if it came from the outside, you would not yield to it if something in you were not receptive to it. For instance, could you be tempted to commit murder? Certainly not. But you can be tempted to give in to your faults, whatever they may be. Therefore it is important to realize that you can be tempted, and in what way. You have to know your faults. List all your faults, so that you remember them. And then ask again for the strength and the help, for you cannot overcome the faults on your own. Only in that notion lies temptation. No devil, no Satan could get at you if you did not have something in you that responded. When you pray that God keep Satan away from you, you are therefore in error. For in you, in your lower self, in the crust that envelops your perfect self, lies the germ through which you can be led into temptation. The dark forces serve as instruments to draw it out, to bring it into your awareness, so that you can fight it. If the germ of evil lay dormant, if it had no opportunity to manifest, you would not come one step nearer to perfection, to true bliss. BUT DELIVER US FROM EVIL. Here, too, the same truth applies. The evil is in you. If it existed only outside, it could not touch you. Put this thought into your prayer. Ask Christ to help you overcome temptation, so that you can deliver yourself from evil. Only you yourself can do it, with the help of God, and with the help of Christ which he has promised you. Try it with his help. Do not try to do it alone; you are not strong enough. You need the willpower, you need unceasing effort, but your power alone is just as insufficient as God’s, Christ’s, or any spirit’s help would be without your will to free yourself. You need both your willpower and the help of God. You must approach the problem from both sides: Do your own work and you must ask for spiritual help, again and again. FOR THINE IS THE KINGDOM. The Kingdom of God is within you. It shall belong to God and to no one else. THE GLORY, which you can attain only by following God’s will. I could say many more things about this most beautiful of all prayers, which contains everything—yes, everything—you need for your life, but there is not enough time now. I have given you a few clues, and it would be good if every one of you who hears or reads these words would think about them in their quiet hour. Perhaps you will then receive further thoughts and feelings about how to apply them very personally in your life. This then is living prayer, when the meaning of each word expands as the interpretations become clearer to you and you see how you already apply the essence of the prayer in certain areas of your life and not yet in others. If you try to live in this way, you must become happy, my dear ones, and eventually all problems will disappear. True, they are there at first, but they are the necessary medicine. You will increasingly gain mastery over yourself and consequently mastery over life, instead of being mastered by life. Ask the question: “How happy am I?” You may be certain that to the degree you are happy you can also make another one, or several human beings, happy. And also know that to the degree that you lack happiness, you cannot yet make others as happy as one day you will, if you continue to follow this upward path. Self-examination about your own happiness is a simple little yardstick or barometer on which you can measure how much happiness you are able to give. If you are filled with the desire to make others happy, then God will provide the opportunity, and this is the way in which you will be blessed with true happiness. And now, my dear ones, I am ready for your questions. QUESTION: Is it all right for a medium to make a living through her task? There are different views about this. Although it is clear that a medium has to earn a living just as any other person—and, if it were done in any other way, she might not have enough time to fulfill her task which is often a very important one—yet, various spiritual sources claim that this should not happen. So there is a problem here. What can you tell us about this? ANSWER: This is what I have to say: If every medium who is still in training knew that he or she could make a living also through this task, that is, if such a person counted right from the beginning on this, there would be even more nonsense and misuse of this gift than there already is. The temptation, even for a decent person, full of good will, would be too great. Therefore, God’s spirits are very cautious around this subject and it is usually good for a human being to approach this task thinking that in no way would it lead to personal gain. But I will add this: A medium should have given his or her service for free for at least three to five years before beginning to make a living through this task. During the years of training, God’s spirit world has an opportunity to observe whether the person is really fit for this task. If not, God’s spirits will withdraw anyhow. After all, money is only one of the many obstacles that can cause people to fail. When, however, a person turns out to be capable of fulfilling such a task, money will no longer be a hindrance, it will not influence the person, or taint the work. So at least three to five years should first pass. And when everything is right, when the spirit world does not withdraw, then guidance will come from the outside and there will be signs to indicate that the time has come to accept money. It will be just as it was at an earlier stage, when the guidance suggested that the medium can now channel also for other people to help them. This took time, too, depending on the person’s progress. Various “green lights” are given in the course of training. Of course, some people don’t need to earn their living through mediumship because they have enough without it. If not, God’s world will see to it that the person in training has sufficient means to live. In principle, to claim that a medium should not be rewarded by earning a living with his or her channeling is of course quite unjustified, after having invested in her profession just as much time, effort, and energy as any other professional person—and often even more. Equally unjustified would be to imply that simply because a medium accepts money the contact would not be with God’s spirits, that she must be a fraud. If you are looking for an argument to disbelieve, you will always find one—you would find something else if the medium did not accept any money. After all, even when not being paid, a medium can have contact with spirits who are in no way connected to God’s spirit world. Ego, power, vanity, pride, craving for admiration can be just as great hindrances. So, you see, the matter is not that simple. The truth will become obvious during the training period, and when everything is right, monetary compensation will be forthcoming without asking for it. The training period of three to five years, however, doesn’t only mean developing the capacity to channel, but, most of all, concentrating on walking the spiritual path of development in the sense I am teaching it. If this is the case, then the contact will always be under divine protection, regardless of external circumstances. Of course, a medium should not refuse help to someone who is poor and cannot afford to pay. But it wouldn’t be right for someone who is willing to spend money on other things—and often on much less important things—to expect the medium to give her time and service for free, unless the medium is still in training. If, all through this time, a medium is working on the path of self-development, then neither material self-interest nor vanity or any other obstacle will stand in the way. Of course, no one can evaluate the situation from the outside, unless he or she knows the medium very well, but the medium herself, and God, will know the truth. And that is what counts. A medium who pursues this kind of training goes through a learning period very similar to a doctor or a teacher who attends a university for years. A physician treats patients also without being paid, for instance in a hospital while still in training, until he or she has reached the expertise that enables him to earn a decent living as a physician. Then, when he has earned his degree, he can be an honest, conscientious and good doctor, even though he earns money with it. If a medium is really capable of giving help, it would be absurd to devote her time and energy to a profession for which she is not trained, with which she could not be helpful, and which would prevent her from fulfilling the task she is best prepared for. It would be as if an excellently trained physician pursued medicine only as a sideline, not being supposed to earn a living that way, and therefore would have to take a different kind of job just to earn his bread. Any prospective medium should, therefore, be prepared to work for quite a long time without being paid. God’s world will give help and guidance, so that meanwhile the person will be provided with what is necessary. And when the time comes, God’s world will help again by slowly withdrawing from the medium the occupation that was necessary until then. And those who avail themselves of the medium’s help, time, and effort, should, as a matter of course, wish to enable the medium to earn her living—everyone according to their means. This would be beneficial for them, too, in every respect. Something must be wrong with your own thinking if you raise doubts about the medium just because of this, and then you should examine yourself and rethink your conclusion. QUESTION: You said in today’s lecture that when something weighs heavily on one’s chest, we should ask ourselves what in us is wrong. But the heaviness may come also, for instance, from grief? My dear ones, receive God’s blessing through my hands, through the hands of the medium. This energy wants to penetrate into you to strengthen you and lift you up. God’s blessing reaches all of my friends, near and far. Be in God.